On Friday 20 July I had the pleasure of presenting the keynote for the UQ Cyberschool Seminar, which is an annual professional learning event for educators, with a particular focus for teacher librarians. I have included my presentation below, and also have put together some resources to support the ideas that I discussed. please feel free to wander through all of my posts here on my blog, and share your thoughts – it is through the connection and dialogue the blog generates that the most learning happens!! Here is a summary of some of the concepts and ideas I spoke about, with links to supporting readings and resources. Remember, if you have any questions or comments, or would like to contribute your own thoughts and opinions, drop me a line in the comments below the post! The idea that we are living in a network society is one has been described by Jan van Dijk in his book The Network Society and also Manuel Castells in his trilogy which begins with The Rise of the Network Society. A network society is one which is based on digital networks. Previously, our social structures (families, organisations, communities) were based on face to face interactions. In the network society, much of the interaction we have with others at all levels (home, business, government) is mediated by digital networks. the skills to navigating networks in order to find quality information, and being able to make use of the connections available to people and information to create, remix, redesign and redistribute content (Jenkins, 2009). Jenkins talks about network literacy extensive in his work – check out his books Spreadable Media, Confronting the Challenges of a Participatory Culture and Participatory Culture in a Networked Era. This time of transformation is a very exciting yet challenging one for all libraries. The final Horizon Report for libraries suggested that embracing this need for radical change is a wicked challenge facing library staff. I suggest that the wicked problem is not just the embrace of radical change by library staff. Just as significant is the need to communicate how libraries have and continue to change, and advocating to the community how they continue to play a vital role. One way forward, and the position that I take in this presentation, is to position the library as a hub for connected learning. 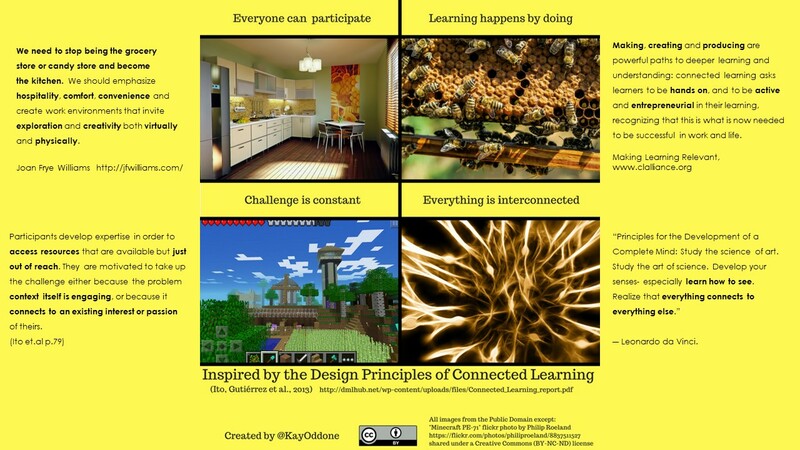 Connected learning is both a learning strategy and a blueprint for learning design. Using a connected learning approach may give a pedagogical language to describe the innovations the library is undertaking. This may be particularly useful for school libraries, who may find that stakeholders within the school community understand a pedagogical approach more easily. The connected learning framework may also give direction for future innovations – by providing a strategic framework that guides the role of the library as central hub within the school. Connected learning is a pedagogical approach, underpinned by networked learning and connectivism. It is framed around the valued of equity, full participation and social connection. You can read about connected learning in more detail in my previous blog posts here and here. You can also download for free the PDF Connected Learning report, which sets an agenda for research and design. Connected learning is based upon networked learning and connectivism, which I have also blogged about previously. Connected learning encourages learning that is interest powered, peer supported and academically oriented. It is designed around learning opportunities that are production centred, openly networked and involve learners drawn together by shared purpose. The framework provides a pedagogical approach for developing a context and capabilities which leverage students’ personal interests, their strong connection with their peers, and the affordances of social technologies to create amplified opportunities for learning. The library provides a third space – neither classroom nor home, and a safe space – away from the real or perceived pressures students may feel in their academic, sporting, social or family lives. Students are not grouped according to artificial categories such as year level, ability level or subject area. They can join with other students, teachers and even parents and community members to learn together in areas of shared interest and passion. The school library is situated at the intersection of the three key contexts for learning identified by connected learning – interests, academics and peer culture. The school library offers equity and access to learning, which are the values connected learning are based upon. The school library offers low barriers to entry, offering the physical and digital convergence which supports a 24/7 participatory culture. How might school libraries design a connected future? The first step – by having teacher librarians, teachers and other school staff model and scaffold being connected learners. A connected learner develops and maintains a personal learning network which provides opportunities to enhance professional or academic capabilities, develop a sense of themselves as a learner and as a professional and to contribute and actively participate in the learning process for and with others. If the idea of a PLN is new to you, or if you need a refresher, I have presented two short videos explaining my research about teachers’ experience learning through PLNs in this blog post. My research suggests that these opportunities for learning may be described as the pedagogical, personal and public arenas, and I will expand upon these areas in future blog posts. Through the PLN, the connected learner has the opportunity to create learning opportunities that not only meet their own professional and personal learning goals and needs, but which may amplify through the network to contribute to the learning of others. The second step – use the connected learning design principles to create a context which enables connected learning opportunities to evolve. These principles are that everyone can participate, that challenge is constant, that learning happens by doing and that everything is connected. Click to access the enlarged image. By creating an environment that encourages creativity. Find more resources, as well as some examples of online communities that enable connected learning experiences in this Pinterest board.